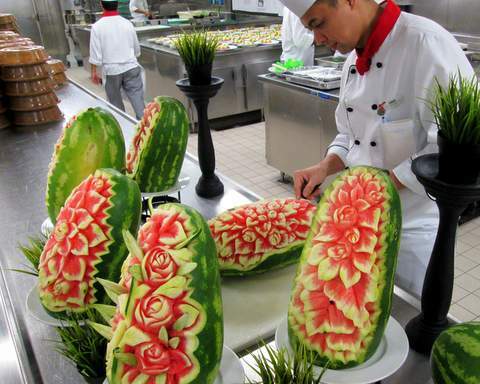 If you are one of the millions of people who enjoy cruise ship vacations every year, you've definitely wondered how so much excellent food can be prepared for so many people in such a short time. Since we've enjoyed Galley Tours on a variety of ships and lines, let us share what we learned on our recent Galley Tour on the beautiful Carnival Breeze. The Carnival Breeze has an average capacity of about 3700 passengers but can accommodate as many as 4700. Every one of those passengers is expecting quality breakfasts, lunches, dinners and snacks around the clock. That amounts to 12,000 meals and snacks a day for Carnival’s guests. That's a lot of food! If you'd like to see for yourself how this culinary magic happens, be sure to sign up for the Carnival Behind The Fun Tour. The Behind The Fun Tour is a guided tour that provides guests with a unique insight into shipboard operations and places that are normally off-limits to guests. During the tour, key shipboard personnel such as the captain, chief engineer, chef de cuisine and certain department heads, share their particular area of expertise. * Go backstage in the main show lounge and see what it takes to create Carnival’s award-winning shows. * Visit restricted areas such as the laundry room, crew galley, crew dining room, crew gym and crew training center. * Visit the main galley where talented culinary artists prepare upwards of 12,000 meals and snacks a day. * Visit the ship’s bridge and engine control room and meet with the captain and chief engineer. Behind the Fun participants also receive commemorative gifts including a custom-made Behind the Fun baseball cap and lanyard and complimentary photos with the captain on the bridge. Behind the Fun’ can only be purchased on board through the Shore Excursion Desk. Depending on the duration of the cruise, the cost is $55 USD to $95 USD per person. The tour is approximately 2 to 3.5 hours long. Capacity is limited to 16 guests per tour. Tours are conducted on the last sea day of each cruise. Guests must be 8 years of age or older to participate; anyone under 18 must be accompanied by an adult. Guests are not permitted to have cameras, cell phones or video recording equipment on the tour. 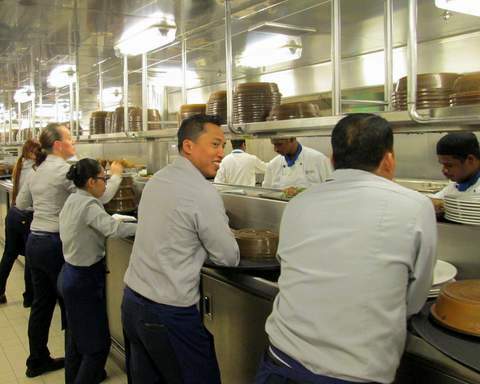 ​​Now....back to discovering just what happens in a cruise ship kitchen. 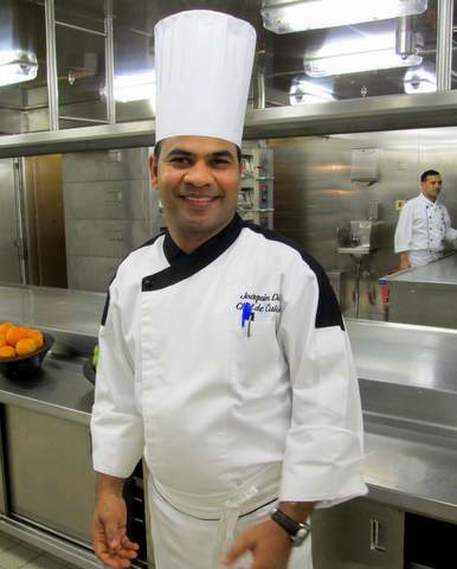 We were treated to a private Galley Tour by Carnival Breeze Executive Chef Joaquin R. Dias. 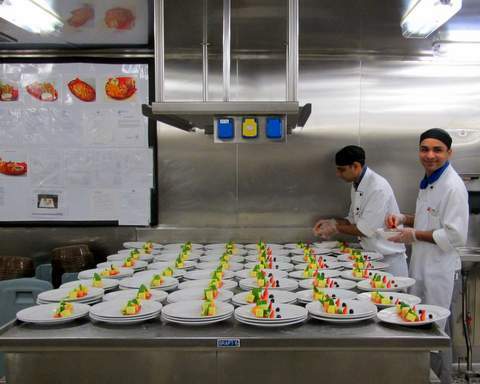 After guiding us through an extremely fast moving revolving door into the heart of the galley, Chef Dias led us through a very organized environment where literally hundreds of people work in designated preparation areas creating their piece of the food puzzle that will become a delicious meal. "We have 166 chefs on staff. 100 chefs prepare dinners each evening. We have 18 chefs just for pastries," Chef Dias said. "Our chefs have ranks like Executive Chef, Sous Chef, Pastry Chef, Station Chef, and so on. Everyone has a specific job and responsibilities," Chef Dias told us. Waiters place orders by computer. Chefs prepare orders. Waiters retrieve orders and deliver them to guests. Food is car​ried to the guests via extremely fast-moving revolving doors and escalators. One galley prepares food for both dining rooms. Another galley prepares food for the Lido buffet. 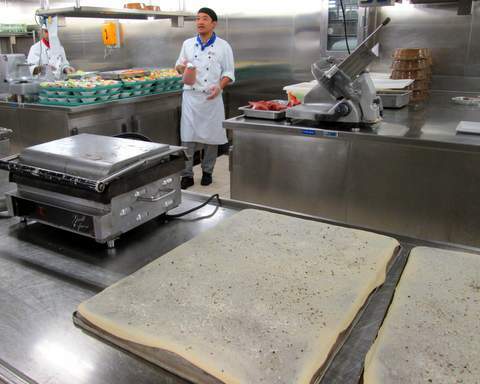 "Here is an example of the amount of food we prepare daily. We have about 3700 passengers. On lobster night, we prepared and served 14,000 lobsters alone!" Chef Dias told us. We noticed that the galley was spotless and perfectly organized for having so many people at work on so many projects at the same time. Chef Joaquin R. Dias told us that he creates and oversees a log of every food item, recipe and ingredient on board. The log keeps track of when the item came on board, how long it will be fresh, what recipes it is used in, when it has been used, how much has been used, etc. Cruise ship galleys are subject to surprise inspections by government agencies. The chef and staff have no warning of when an inspection may occur. Inspectors test food, temperatures, storage, freezers, processes and logs just to name a few things. "On our last inspection, six inspectors came on board. We scored a perfect 100 out of 100," Chef Dias said. All food supplies come from sources in Miami, Florida where Carnival can be assured of quality and safety. If you'd like a more private dining experience, Chef Dias offers a Chef's Table Experience two to three times per cruise. The cost $75 per person. Guests are seated in the midst of the galley action for dinner for an educational and delectable experience. Delicious meals and snacks are a large part of an enjoyable cruise. If you'd like a peek into what goes on behind the scenes to get those dishes to your table, we highly recommend a visit to the galley through Carnival's Behind The Fun Tour or the Chef's Table Experience.